Egrets - and other wading birds of all shapes and sizes - are abundant and unafraid of visitors along Black Point Wildlife Drive in the Merritt Island National Wildlife Refuge. Mikah, who’s on a mission to visit all of the more than 400 sites within the National Park Service (NPS), found it fascinating that Canaveral National Seashore makes up the largest stretch of undeveloped beach on Florida's East Coast. That lack of development attracts many locals and tourists, who come to enjoy nature in its most primitive form. And without the pollutants that normally result from development, the water is cleaner too, Mikah noted. That, in turn, attracts fish... and fishermen. 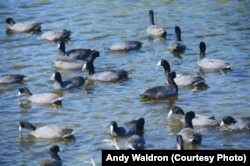 This flock of coots is just a fraction of the waterfowl that spend the winter at Canaveral National Seashore and the adjacent Merritt Island National Wildlife Refuge in Florida. 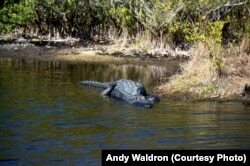 Many say no animal better represents Florida than the American alligator. They are one of the main attractions at the Canaveral National Seashore. He also saw a wild boar in the distance, wading through the shallow water, but Mikah was most impressed with the 'gators living so close to the ocean.